Eli Whitney (1765 – 1825) was an American inventor best known as the inventor of the cotton gin. This was one of the key inventions of the industrial revolution and shaped the economy of the South. Whitney's invention made short staple cotton into a profitable crop, which strengthened the economic foundation of slavery. Despite the social and economic impact of his invention, Whitney lost his profits in legal battles over patent infringement, closed his business, and nearly filed bankruptcy. The cotton gin is a mechanical device which removes the seeds from cotton, a process which, until the time of its invention, had been extremely labor-intensive. The cotton gin was a wooden drum stuck with hooks, which pulled the cotton fibers through a mesh. The cotton seeds would not fit through the mesh and fell outside. Whitney occasionally told a story where he was pondering an improved method of seeding the cotton and he was inspired by observing a cat attempting to pull a chicken through a fence, and could only pull through some of the feathers. A single cotton gin could generate up to fifty-five pounds of cleaned cotton daily. This contributed to the economic development of the Southern states of the United States, a prime cotton growing area; some historians believe that this invention allowed for the African slavery system in the Southern United States to become more sustainable at a critical point in its development. 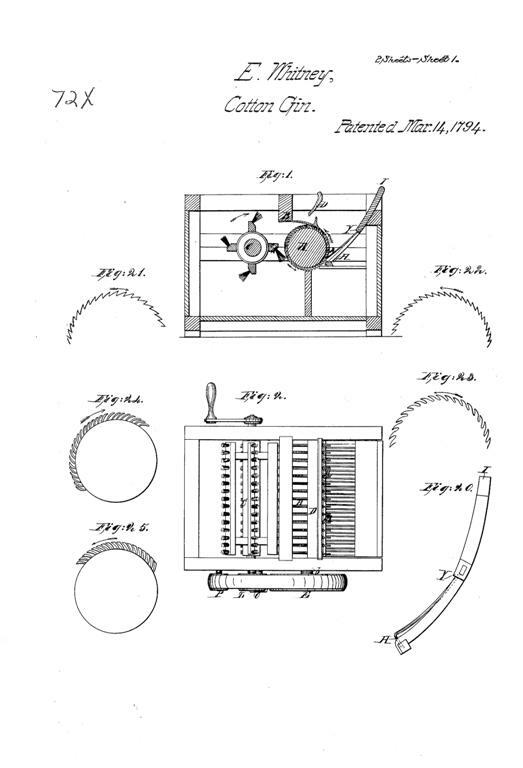 Whitney received a patent (later numbered as X72 *) for his cotton gin on March 14, 1794; however, it was not validated until 1807. Whitney and his partner Miller did not intend to sell the gins. Rather, like the proprietors of grist and sawmills, they expected to charge farmers for cleaning their cotton - two-fifths of the profits, paid in cotton. Resentment at this scheme, the mechanical simplicity of the device, and the primitive state of patent law, made infringement inevitable. As Whitney and Miller were unable to produce enough gins to meet demand, imitation gins began to spread. Ultimately, patent infringement lawsuits consumed the profits and their cotton gin company went out of business in 1797. While the cotton gin did not earn Whitney the fortune he had hoped for, it did give him fame and the cotton gin transformed Southern agriculture and the national economy. Southern cotton found ready markets in Europe and in the burgeoning textile mills of New England. Cotton agriculture revived the profitability of slavery and the political power of supporters of the South's "peculiar institution." By the 1820s, the dominant issues in American politics were driven by "King Cotton": maintaining the political balance between slave and free states and tariff protection for American industry. Cotton exports from the South boomed after the cotton gin's appearance (going from 180,000 pounds of total cotton production in 1793 to 93 million tons by 1810) while New England manufacturing companies struggled to compete against imported goods and clamored for tariff protection. The cotton interests led the country into war with Mexico, expecting a vast expansion of cotton agriculture. Cotton was a staple that could be stored for long periods and shipped long distances, unlike most agricultural food production. Paradoxically, the cotton gin, a labor-saving device, helped preserve the weakening arguments for slavery, since cheap (slave) labor was needed to pick cotton. Later, the 20th century invention of the cotton-picker reduced the labor-intensive demands of cotton farming, and brought unemployment to many poor Southerners. The immediate effect of the gin was to cause a massive growth in the production of cotton in the American South. Whereas cotton had formerly required considerable labor to clean and separate the fiber from the seeds, the cotton gin revolutionized the process. The wholesale price of cotton plummeted as output increased dramatically. Cotton cloth (which had formerly been quite expensive) was manufactured in bulk in England and the NE United States. Large areas of land on American states such as Mississippi were cleared and planted with cotton to meet increasing demand. An unfortunate by-product of the cotton gin was the expansion of slavery through the region, as laborers were needed to plant and harvest cotton. Many of the plantations of the Antebellum South were built on cotton fortunes, which could not have occurred without the cotton gin's invention. * The X-Patents are all the patents issued by the United States Patent and Trademark Office from July 1790 (when the first U.S. patent was issued), to July 1836. The actual number is unknown, but the best estimate is 9,957. The records were burned in a fire, in December 1836, while in temporary storage. No copies or rosters were maintained by the government at the time, leaving only the inventors’ copies to reconstruct the collection. 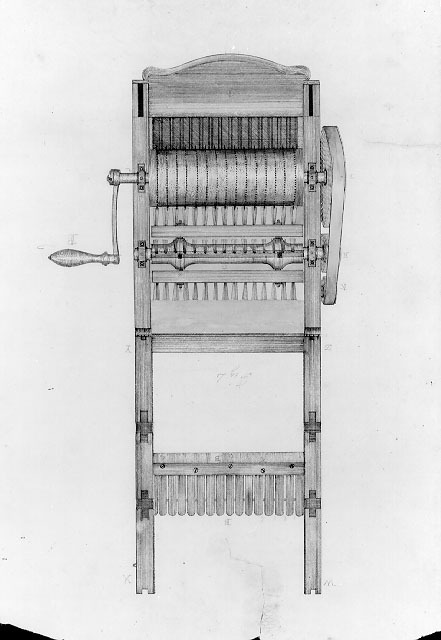 Drawing of Eli Whitney's cotton gin, circa 1795. Courtesy of Textile Industry History. Original drawing by the United States Patent Office. Building, today, a cotton gin is not complicated, though some mechanics skills are required. A fair quantity of cotton bolls is needed in order to demonstrate the operation of the machine. Mirsky, Jeannette and Allan Nevins. The World of Eli Whitney. New York: Macmillan Co., 1952.